It is portable, reusable grow room having reflective material on the inside, and a sturdy canvas exterior. It also provides insulation to prevent heat escape, which aids plant growth. 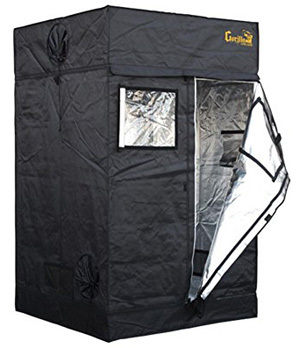 I happened to try out the Gorilla Grow Tent, claimed to be one of the best in its categories. Right from the get-go, I could tell that it was a product that meant business. The packaging, the materials used, all of it pointed towards it being a very good product. In comparison to other grow tents available in the market, this one stood out because of its immense quality level. The thing that pleased me the most was the material used to build the actual tent. The walls of the tent are extremely thick, making the entire structure strong and sturdy. The reflective material on the inside is up to the standard as well. The thickness of the walls makes the tent odor resistant which is important because the smell of manure can be unpleasing, light proof, and provided sufficient insulation. Speaking of materials used to build this thin, the frame of the tent is made 100% from metal. No plastic is used, anywhere. The poles are 19mm thick. This is a major factor that separates it from the other growing tents out there in my opinion. The solid metal frame provides unparalleled sturdiness and strength to the entire structure. There is one doorway in the 4×4 model that I used. It zips around 360 degrees. This provides unhindered accessibility, especially to a person of a particularly large stature like myself. Owing to the adjustable height mechanism available for users, I was able to stand upright and move about freely inside the tent without having to bend. While it is true that the Gorilla Growing Tent is packed with features that make it both extremely user-friendly and durable, it is not necessarily a spotless experience. I did run into some minor issues with the tent while using it. The first problem was with the zipper. It did not close all the way to the end, leaving air gaps. However these gaps put in jeopardy the odor resistance and insulation of the tent. I did contact the company and was able to get a spare piece to fix this problem. Speaking of the company, this is where my next issue lies. The customer service – When I contacted them for a replacement of my grow tent due to the faulty zipper, I was greeted with no response at all. I had to write multiple emails. I eventually did get a response after three weeks. The shipment for the replacement further took two weeks to arrive. So, my proper experience began a month and a half late. Despite having a few flaws, the Gorilla Grow Tent is a very good product which exceptionally serves its purpose well, and it is one of the best indoor tents out in the market. Having some amazing qualities such as being portable, reusable and sturdy makes it a perfect buy for all the intended users.